My cousin Lisa and I have been working together on the Krueger side of our family for many years. Since the beginning of our work, she had told me about rumors of relatives left back in Germany when our family came here from Prussia. [German-speaking Prussians were evicted from their lands after World War II and forced to relocate back in Germany.] Lisa said that her great-grandmother Agnes Krueger had been in contact with these relatives until the 1960’s. It was said that in the aftermath of World War II, when times were desperate in Germany, Agnes had sent “care packages” containing coffee and sugar, along with other difficult-to-obtain items. There was also a cousin of some kind from these German relatives named Brigitte Grubba (b 1935) who came and stayed with them, although neither Lisa nor her mother knew how Brigitte was related. Agnes Krueger’s note on the Kamrath Family. 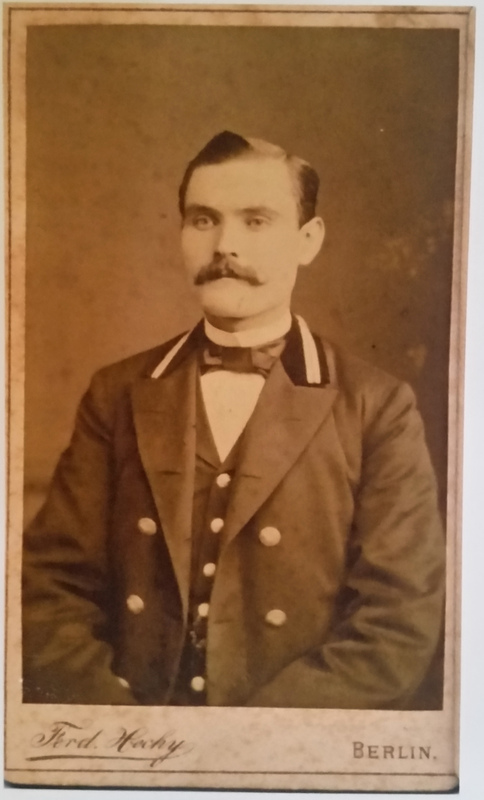 With this information we went to work, and after many months I can present what we have learned about “Hermann” Kamrath, the lost brother of my great-great-grandmother, Bertha Kamrath. Otto Julius Hermann Kamrath was born on 9 Jul 1859 in the tiny town of Hoffelde, in Kreis [County] Regenwalde, in Pommern [Pomerania], Prussia. The town is called Dargomyśl, Poland today. Hermann was the second child and first son of Carl Friedrich Ferdinand Kamrath (1831-1900) and his first wife Wilhelmine Sophie Henriette “Henriette” Pribbernow (1834-1865). Carl was a “Stellmacher” [wagon-maker or wheelwright] who had married Henriette in the town of Plathe in 1857. After their marriage, the couple moved about 14 miles south to the town of Hoffelde in Kries Regenwalde near the town of Meesow, which was Henriette’s home town. The couple’s three known children were born there, including Auguste V. Kamrath, and my great-great-grandmother, Bertha Auguste Wilhelmine Kamrath, who was born 3 Aug 1864. Roggow A and Meesow. 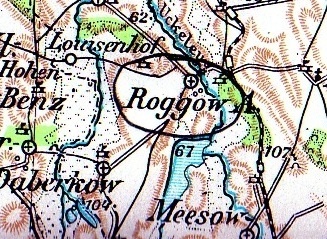 Hoffelde was about a half mile east of Roggow. Sometime between August 1864 and September 1865, Henriette died in Hoffelde. It’s possible there were complications with her delivery of daughter Bertha. 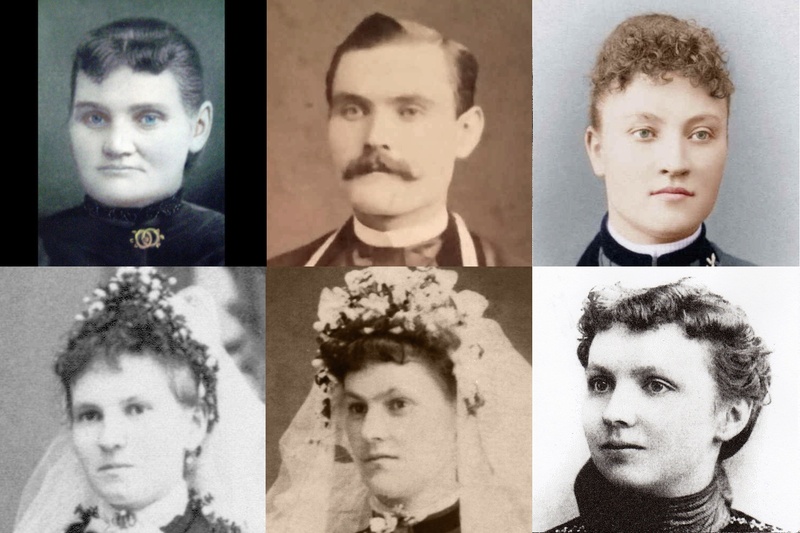 Carl quickly remarried to his second wife Auguste Henriette Sense (1841-1892), and they had five more children together in Hoffelde: Helene Johanna Kamrath (b 29 Jul 1866), Anne T. Kamrath (b 12 Aug 1868), Emma A Kamrath (b 5 Aug 1870), Carl Kamrath Jr. (b 23 Jan 1875), and finally Mathilda Ida Augusta “Ida” Kamrath (b 5 May 1878). Top: Auguste, Hermann, Bertha (l to r). Bottom: Helene, Emma, Ida (l to r). Like all Prussian men, Hermann was required to be in the military. 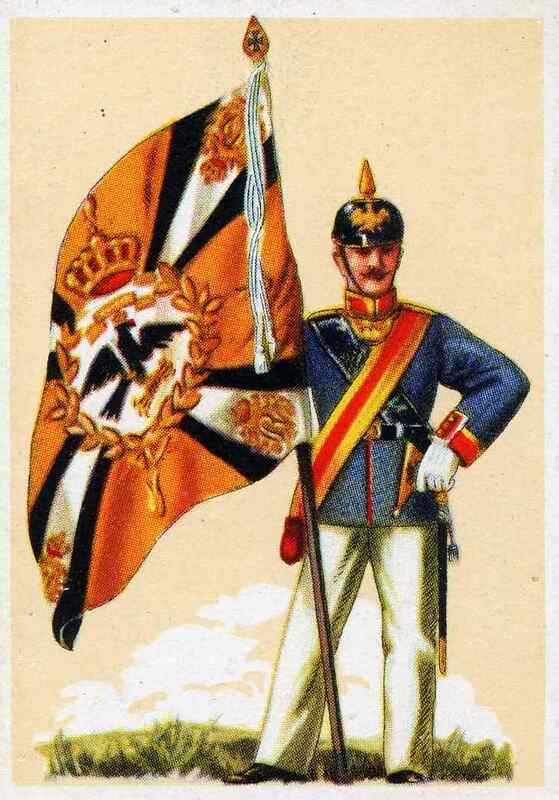 There is a document which suggests that at the age of 18 (in 1877) he enlisted and served as a “gefreiter” [Corporal] in the province of Ostpreussen (East-Prussia) in the 7th Ostpreussen Infantry Regiment Nr. 44. This would have taken him far from home, about 200 miles east of the family home in Pomerania. Infanterie-Regiment Graf Dönhoff (7. Ostpreußisches) Nr.44. Courtesy of Wikipedia. While there, it seems he met a Polish, catholic, farmer’s daughter named Helene Zielinski. Hermann, like his entire family, was Lutheran (evangelical), and culturally German. Helene was born on 9 Nov 1863 in the town of Barlewitz, Kreis Stuhm on the border between the provinces of Westpreussen and Ostpresussen. It is called Barlewice, Poland today. Her father, Johann Zielinski, was an eigenthümer [farm-owner]. She would have been about 14 and Hermann about 18 when they met. From what I can tell, Hermann’s regiment was stationed in the town of Graudenz, about 36 miles south of Barlewitz. Something substantial must have occurred between them, and evidence would suggest that Hermann and Helene stayed in touch for several years even after Hermann returned back home from his deployment in Ostpreussen. At some point Hermann settled in Berlin, Germany where he found work as a “portier” [doorman]. It almost certainly would have caused great tension in the two families if their relationship were known since the Germans and the Polish generally did not get along at all, and evangelicals almost never inter-married with catholics. But with Hermann in Berlin and his family still in Pomerania, perhaps a long-distance relationship of some kind could thrive. In May of 1883, Hermann’s half-sisters Anne and Helene boarded the ship “Bohemia” in Hamburg, Germany and went to America. Around the same time, his full-sister Auguste went to America also, meeting and marrying a Bavarian man named Simon Wimmer in the town of Grand Rapids, Wisconsin on 4 Jun 1883. Things must have gone well for the other two sisters in Wisconsin, because two years later in May of 1885 everyone else in Hermann’s family [father, step-mother, sister Bertha, and three half-siblings] boarded the “Hammonia” and went to Wausau, Wisconsin, settling in on a farm in the Town of Maine in Marathon County. Kamrath Family on the “SS Hammonia”, departure from Hamburg. 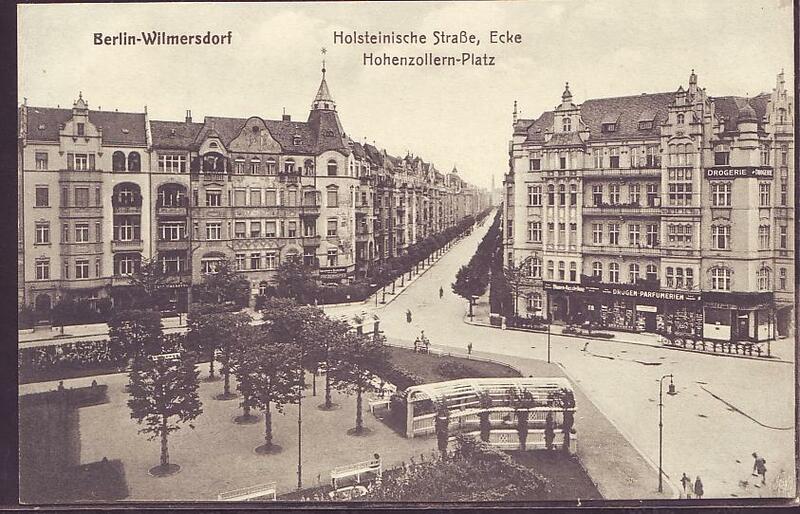 At some point before 1885, Helene Zielinski left her family home in Baumgarth, Kreis Stuhm and came west to Berlin to live with Hermann. At that time Berlin was a city of 1.3 million people, and it was possible to be essentially anonymous there, especially compared to the rural Prussian countryside where Hermann and Helene had both grown up. Although their relationship would probably have, as stated before, caused problems with their families, they suddenly found themselves in a situation where Hermann’s entire family was in America, Helene’s mother was 200 miles away, and her father had passed away. That being the case, the couple were married in Berlin on 10 Oct 1885, only a couple months after Hermann’s family sailed for America. No. 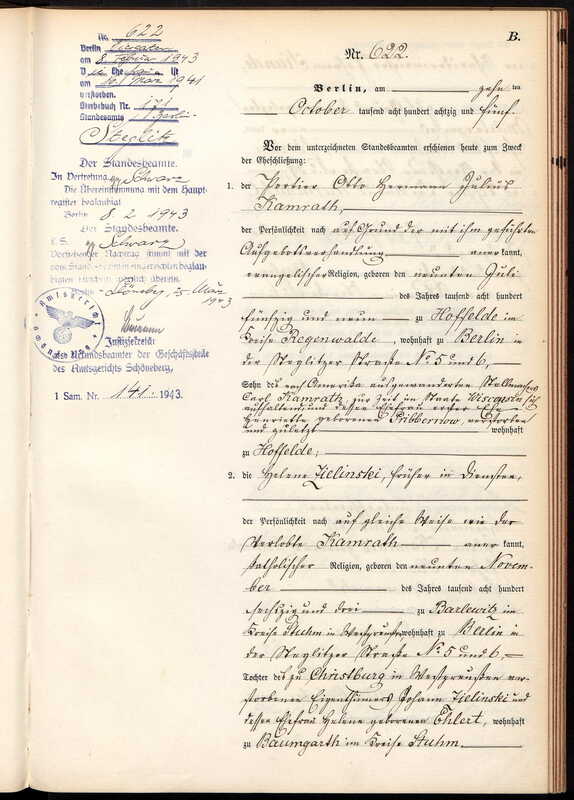 622, Berlin, the 10th of October 1884, before the registrar came the “Portier” (doorman) Otto Hermann Julius Kamrath, evangelical religion, identified by the marriage banns register, born the 9th of July 1859 in Hoffelde, Kreis Regenwalde, resident of Berlin, Steglitzer Straße No. 5 and 6, son of the “Stellmacher” Carl Kamrath, who emigrated to America and is currently residing in state of Wisconsin, and his deceased wife Henriette née Pribbernow from his first marriage, last resident in Hoffelde, and Helene Zielinski, “früher in Diensten” – previous to be in service, identified in the same way, the fiancé did, catholic religion, born in November, 9th, 1863 in Barlewitz, Kreis Stuhm, WestPreussen, resident of Berlin, Steglitzer Straße No. 5 and 6, daughter of the “Eigenthümer” (farm-owner) Johann Zielinski, who died in Christburg, (Kreis Stuhm) Westpreussen, and his wife Helene née Ehlert residents of Baumgarth in Kreis Stuhm. Witnessed by the “Schneidermeister” (master tailor) Johann Kunde, identified by his military pass, 35 years old, resident of Berlin, Genthiner Straße Nr. 39 (Berlin-Tiergarten) , “Tischler” (cabinet-maker) Ferdinand Wurmmehl, 32 years old, identified also by his military pass, resident of Berlin, Schwerinstraße Nr. 6. Helene must have become pregnant almost immediately, and their first child, Else Helene Frida Kamrath was born on 11 Jun 1886. Hermann and Helene had moved to Schwerinstraße 11 in Schöneberg [at that time a town just outside of Berlin, but a part of Berlin itself today]. Three more children followed: Paul Hermann August Kamrath was born 19 Nov 1887 and died less than two months later on 2 Jan 1888, Helene Franziska Auguste Kamrath was born on 25 Nov 1888 and died a little over a year later on 16 Mar 1890, and then finally a son named Franz Hermann Paul “Paul” Kamrath was born in Schöneberg on 8 Jan 1891. Hermann and Helene had moved to Nollendorfstraße 2 by this point. Sadly, in 1909 Hermann died at the Viktoria Krankenhaus (hospital) at the age of 49. Nr. 903. Schöneberg, 1 Jun 1909. It is reported that the “Wächter” (watchman or guard) Otto Hermann Julius Kamrath, 49 years old, evangelical religion, resident of Schöneberg Kyffhäuserstraße 10, born in Hoffelde, Kreis Regenwalde, married in Schöneberge to Helene née Zielinski, son of “Stellmacher” Karl Kamrath and his wife Henriette née Pribbernow, both deceased, last resident in America, died 29 May 1909 in Viktoria-Krankenhaus (hospital) in Schöneberg. No cause of death was given, unfortunately, nor was a place of burial specified. A subtle point here – Hermann knew his father had passed away in America, which proves that he was still in touch with the family despite the vast distances that separated them. It’s almost painful to think about all those letters in German going back and forth and how valuable they would be today in terms of knowing these people. Nr. 171. Berlin – Steglitz, the 18th of March 1941. 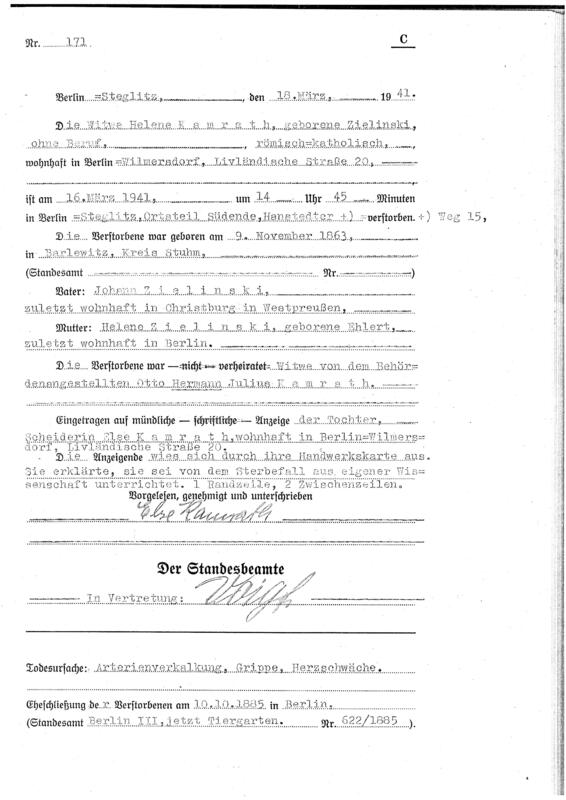 The widow Helen Kamrath, née Zielinski, unemployed, catholic religion, resident in Berlin-Wilmersdorf at Livländische Strasse 20, died on 16 Mar 1940 at 2:45pm in Berlin-Steglitz, Süende District, Hanstedter Route 15. 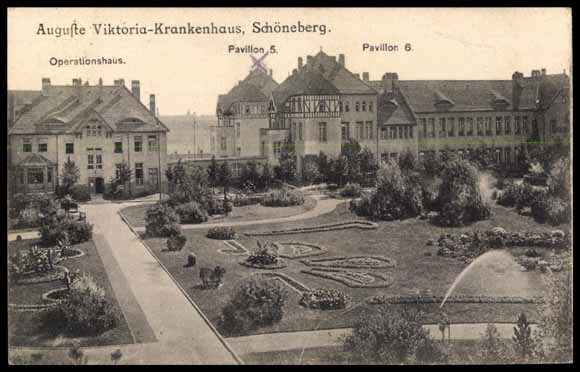 The deceased was born on 9 Nov 1863 in Barlewitz, Kreis Stuhm, daughter of Johann Zielinski, last resident in Christburg in Westpreussen, and Helene Zielinski née Ehlert, last resident in Berlin. The deceased was the widow of the Behördenangestellten (government employee), Otto Hermann Julius Kamrath. Entered on the verbal testimony of the daughter, the seamstress Else Kamrath, resident in Berlin-Wilmersdorf at Livländische Strasse 20. She was identified by her Handwerkskarte (trade membership card), and she explained that she learned of the death. 1) A word was crossed out. 2) A word was underlined. Signed and attested: Else Kamrath. The registrar in representation: Voigt. Cause of death: Arteriosclerosis, influenza, heart failure. ( Record of this death was made on the marriage certificate of the deceased on 10 Oct 1885 in Berlin. Registry Berlin III, Tiergarten, record 622/1885). Hermann’s daughter Else Kamrath died on 9 Sept 1972 in the town of Kötzting in Bavaria, Germany. 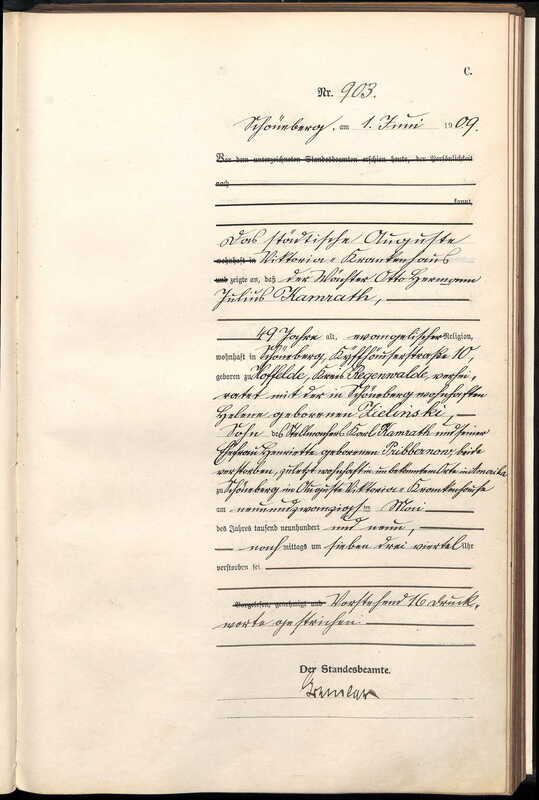 Her death record lists three women, Margaret Grubba, Elisabeth Schreiber, and Charlotte Bürger. I have been able to confirm that at least two of these women were daughters of Else Kamrath, despite the fact that she seems to have never married. Margarete Helene Kamrath was born in Lankwitz-Berlin, Germany on 24 Apr 1906. She married the “verwaltungsangestellte” (administrative staff person) Aloyis Franz Grubba in Wilmersdorf on 9 May 1930. They had at least two children, Brigitte Marie Grubba (b 7 Dec 1935 in Wilmersdorf), and an unknown daughter born in 1940 also in Wilmersdorf. Elisabeth Franziska Helene Kamrath was born 27 May 1909 in Schöneberg-Berlin, and married the “kaufmann” (merchant) Max Willy Schreiber on 27 Mar 1929 in Wilmersdorf. She was listed as an editorial office secretary on her marriage record. They had at least two sons, one born in 1929 and one born in 1937. I’m still trying to find out more about them. Max Schreiber died 26 Feb 1962 in Kreuzberg, Berlin, Germany. Elisabeth was alive until at least 1979, still living at 33 HumboldStraße 22 in Berlin. From 1933 to 1943 Else’s brother Paul Kamrath is listed in the directories as a Schlosser (locksmith) living at Holsteinische Straße 17. Paul married Helene Nowotna in Wilmersdorf on 18 Dec 1930, and they had two sons, Hans Peter Paul “Peter” Kamrath (b 25 Feb 1934) and Hermann (b 26 Oct 1930). Hermann died in 1990 in Berlin, but Peter still lives there in an eldercare facility. He is, unfortunately, not willing to discuss his family, so for now I don’t know if either Peter or Hermann had any children of their own. Paul Kamrath died in Gatow-Berlin on 25 Feb 1963 at the Hohengatow State Hospital. His wife Helene Nowotna died 18 Oct 1964.